Leslie Maunder of HMS Exeter died in the prisoner of war camp at Ambon Island, Indonesia on 13th April 1945. A personal account by Mrs Pat Bartlett of her brother Leslie Maunder, RN. Leslie Maunder's name is one of four on the parish war memorial and one of five on the Roll of Honour in St Torney's Church in North Hill. The following was first published in the North Hill Parish Magazine, May 2015 edition, to mark the 70th anniversary of the end of the War in Europe. 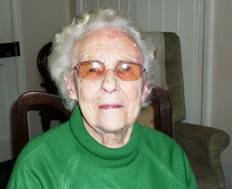 Leslie's story was told by his sister, Mrs Pat Bartlett (pictured here in 2015), who was talking to Mrs Shelby Brown. The parish magazine recognizes Mrs Bartlett's fortitude in its introduction, "Without the courage of Mrs Bartlett in having shared her memories of her brother we would lose touch with what happened. Thank you so very much to Mrs. Bartlett for her time in talking to NHLHG and for the loan of precious photographs. Clearly this beloved brother remains very much in her memories, and we are grateful to her for sharing them with us and for her vivid portrait of a very brave young man." 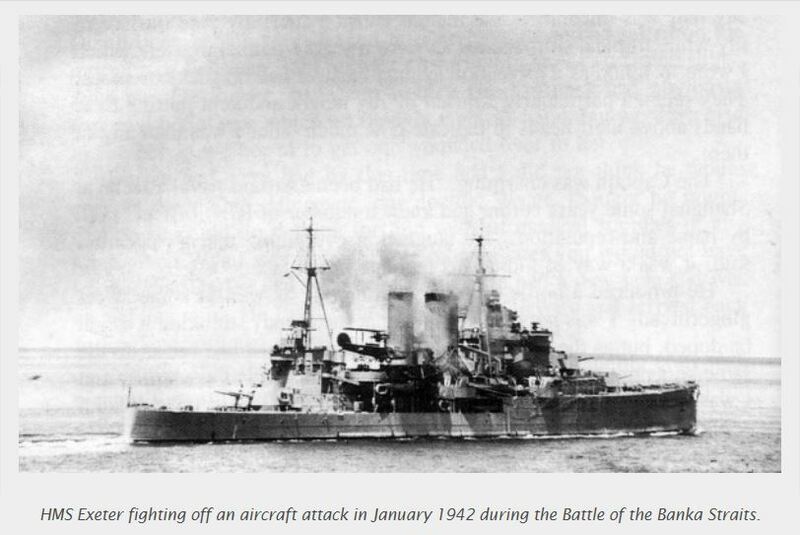 "My brother Leslie was so excited about his very first posting to the famous heavy-cruiser, HMS Exeter, in early 1941. I went to Plymouth with one of my sisters just before the Exeter left in March to wish him well. We were all caught in an air-raid and ended up in a shelter near Mutley Plain, where Leslie immediately set to, to help the elderly people. This was typical. He was always caring and kind, helped our busy mother a lot and was grateful for anything done for him. When the raid was over and we parted, he said, 'Tell Mum I'll be home to see her soon'. I never saw him again. "Leslie Maunder was the third of Mr and Mrs Ernest Maunder's six children, and their second son. Pat was the fifth child. They were a very happy family, and Leslie and his younger brother Charlie (number four) were inseparable, and did everything together as children. Leslie was born at Tremollett, went to school in Coad's Green and attended Sunday School at the Chapel in the village. Indeed, it was Leslie's Sunday School teacher who encouraged him to join the Navy, like so many other young men from the County. "So, at 14 years old, Leslie enlisted as a boy telegraphist, receiving his training at HMS Impregnable, seen here on the left. on the Hamoaze. 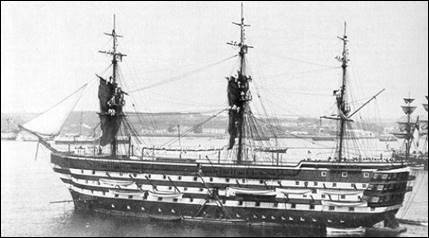 He was still only 17 years old when he joined the crew of the Exeter in 1941, war having broken out in 1939. "HMS Exeter left Devonport after repairs in March 1941 for eventual service in the Far East, where Leslie and the rest of the crew saw much action. She is shown here (right) fighting off an aircraft attack. 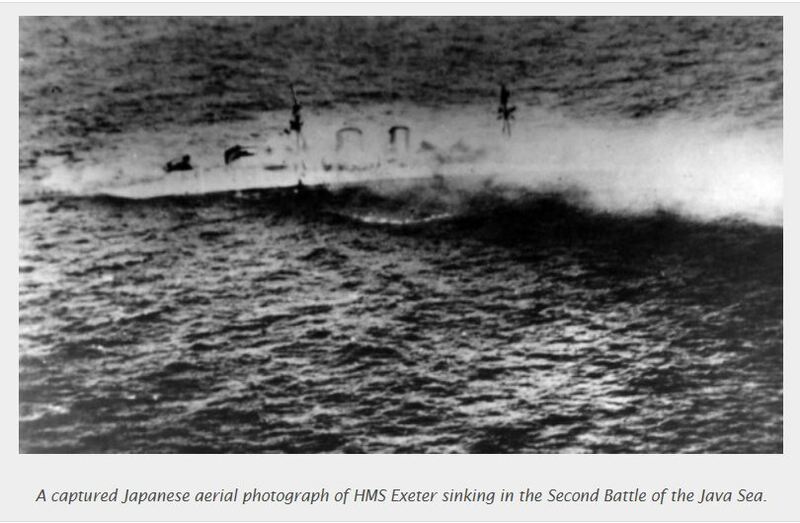 "On 1st March 1942 the Exeter was fatally damaged in the Battle of the Java Sea, and sunk as depicted in this photograph. 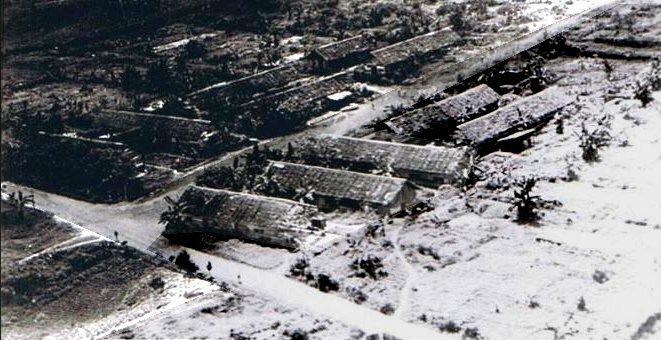 Those crew who survived the initial attacks took to the water, and those that did not perish in the sea were taken prisoner by the Japanese. 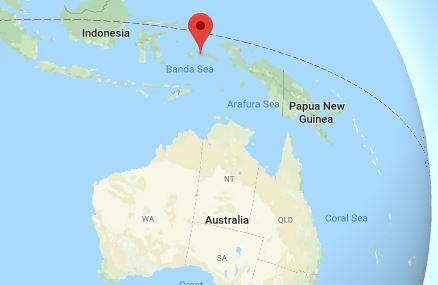 Leslie was one of the latter group, ending up in the grim prisoner of war camp on remote Ambon Island (shown by the marker on this map). 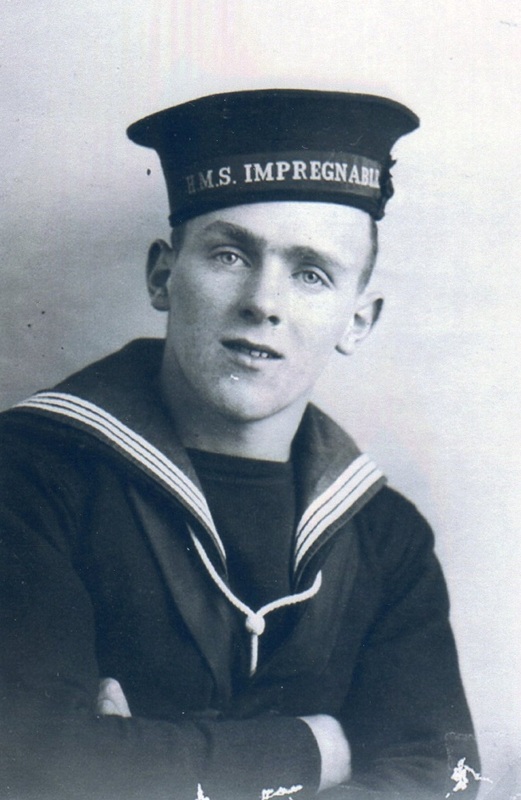 His family, and indeed the Navy, had no idea of his whereabouts, or even if he had been a survivor, for three long years of total silence after he had been posted as 'missing in action'. "The Maunder family's worst fears were realised when a telegram eventually arrived from the War Office with the tragic news that their much-loved son and brother had died in the camp at Ambon on 13th April 1945, just three weeks before VE Day and just four months before the final Japanese capitulation. He was just 21 years old. Leslie is buried with other shipmates at the Ambon War Cemetery (grave no. 29B11) on Ambon Island (shown here), part of Indonesia. "To the last, Leslie thought of his mother and the rest of his family, this being confirmed by a surviving HMS Exeter crew member who had been with him in the camp, coming to see the Maunders after his own repatriation at the end of the war, at Leslie's earnest request."